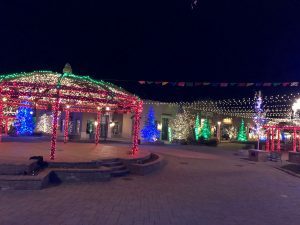 Lumen Lighting is the highest rated Christmas light installation service in the Provo, Salt Lake, & Park City areas. Our pricing is typically 15 – 25% lower than our competitors and only use top quality lights. Although we organized only a little over five years ago our management has over 15 years of experience and our accompanying staff combines for another 10 years. We are fully insured, licensed, and equipped to meet all your Christmas lighting needs. We pride ourselves on being able to provide our customers not only with the best kinds of lights, but also with a wide selection so that your Christmas light decorations are just as special and unique as your home and family. 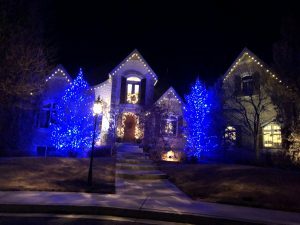 Below you will find a brief description of just a few of the Christmas lights we offer and professionally install. All of our lights come in a variety of colors including warm white (yellowish tint), cool white (more blue), blue, green, red, yellow, Multi-colored, and more; we also have multiple colors for the strands not just the bulbs. 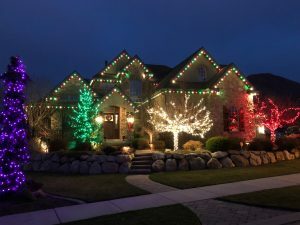 LED c7 or c9 Bulbs – LED has been the most popular choice for all things lighting for the past few years, and Christmas lights are no exception to this trend. The main reasons why is that LED uses less energy and typically have a much longer lifespan. These lights are best for rooflines but also work very well on Christmas trees. The bulbs come in semi-transparent & opaque colors for different styles of decoration. INC c7 or c9 Bulbs – Incandescent bulbs may not have the lifespan of LED but they do produce a brighter more classic look for your home. Help make your home stand out above the rest! Like the LED, these bulbs work best on a roofline but are quite versatile and also come in the same colors and translucence. Traditional Mini-Lights – Available in LED and INC traditional mini-lights are a little bit longer than the Wide-angle, and thereby produce a deeper color at a little bit dimmer of a brightness. They are great for both indoor and outdoor trees as well as lighting other structures on your property. Wide-Angle Mini-Lights – INC & LED options to choose from. Wide-Angle lights are much more popular as they produce a lot more light which means you require fewer strands to get the same effect as their traditional counterparts helping to save you money on your purchase. They are a truly multi-use lighting option. Other Christmas Decoration – We offer garland (both lit & unlit), wreaths, hanging & standing decorations, and much more. If you have any special requests don’t hesitate to ask and we are happy to do all we can to help you find exactly what you need to make your vision for your home come true. We do require that your first year with Lumen that you do purchase your lights from us. After year one you only need to pay for labor in years 2 and afterwards until it comes time to replace your lights, most strands typically have a 5 to 10 year lifespan. If you opt to have Lumen store your lights we do so for only $30 per 18 gallon bin per year, this option comes with a lifetime warranty on your lights. While your lights are up we do offer 1 scheduled maintenance visits and up to 2 on-call visits included in the price. If you have any other questions don’t hesitate to call us or fill out our form below to schedule your free consultation.